Energy Guard Foam Insulators began work just before Steven departed to Berlin for ShowStoppers @ IFA. 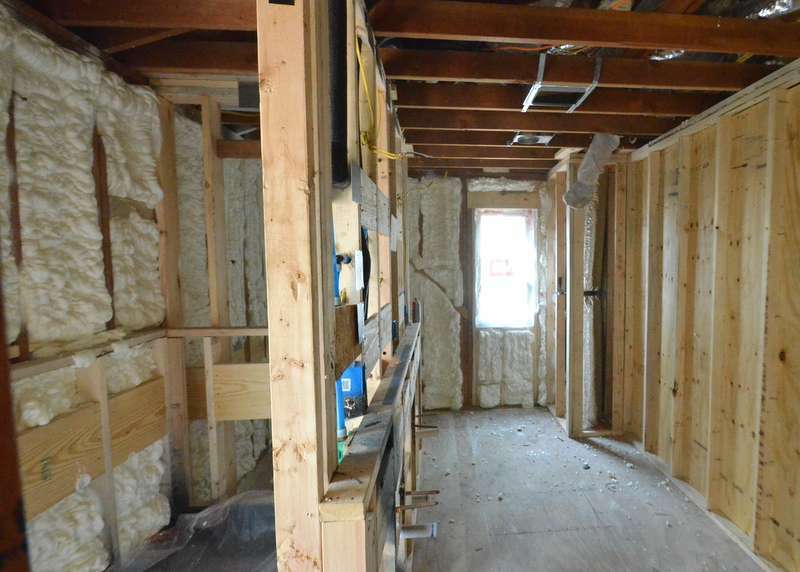 Steven returned to an insulated house, almost ready for drywall — if only the low voltage and structured wiring decision was made and the house cabled for network, telephone, AV, security. 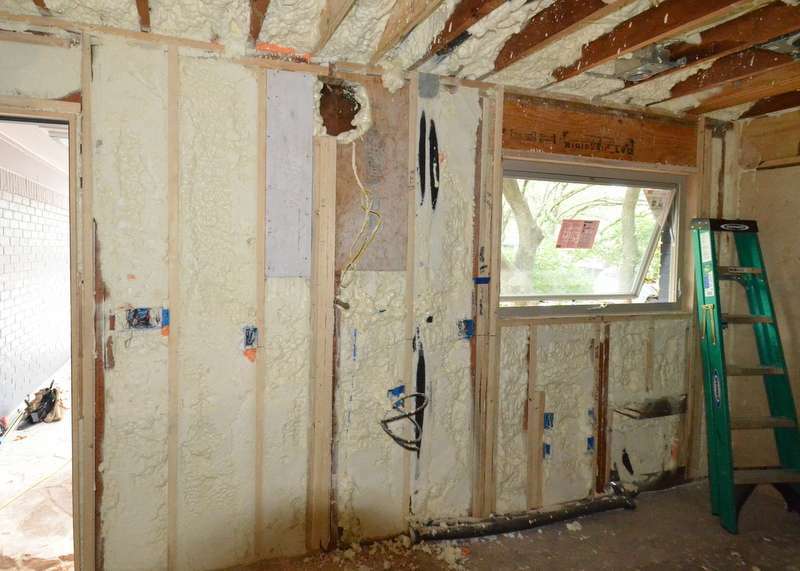 Even at this stage, the insulation is keeping out some of the Texas heat. Two weeks ago, if you walked upstairs, the thermal layer boundary in the stairwell hit you in the face and triggered sweat. Not now. The temperature difference between the cooler downstairs and warmer upstairs — heat does rise — is probably less than 10 degrees. 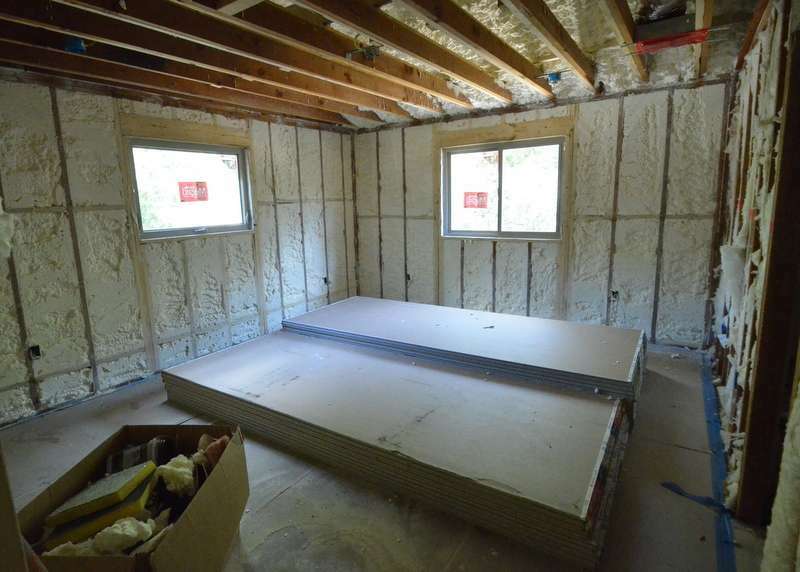 Here are a couple of shots of the foam sprayed into the stud bays on the exterior walls and underside of the roof, and conventional batts on interior walls used as soundproofing between rooms. This will be Steven’s office. Drywall delivered and stacked on the floor. 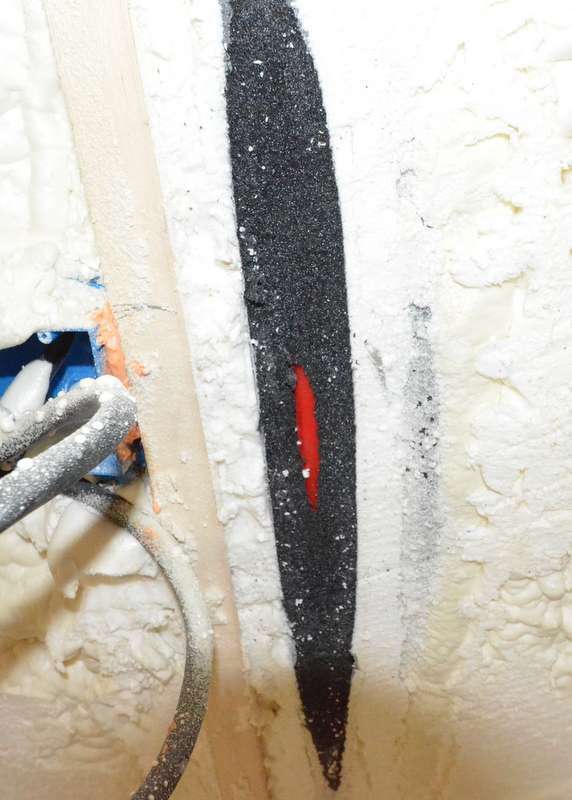 Foam in the exterior walls. This will be bedroom 3, also known as the model train room. Drywall delivered and stacked for installation. Foam sprayed into the stud bays on the exterior walls and the underside of the roof. The laundry/utility room upstairs. Batts in the stud bays at left of photo, in what will be the wall between the laundry/utility room and the master bedroom. Foam sprayed on the exterior wall at the front of the house and the underside of the roof. Foam sprayed on the underside of the roof over the master bedroom. 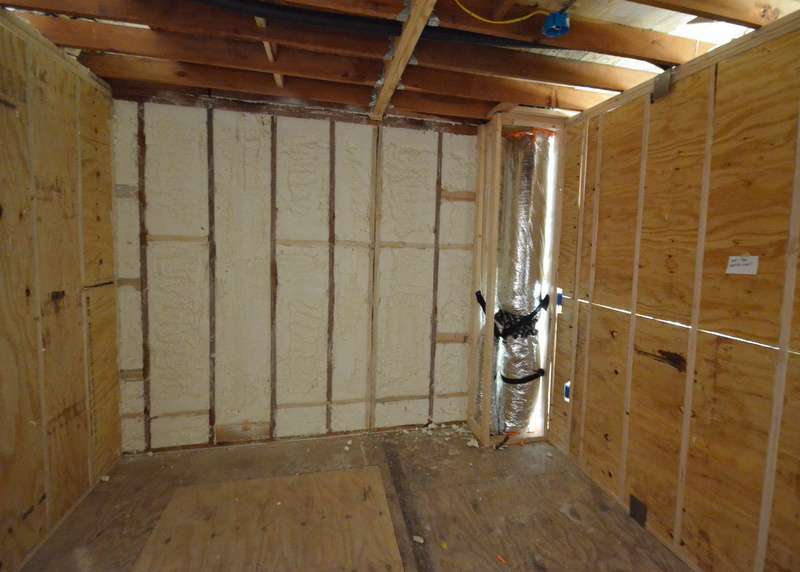 The exterior wall of the master closet, insulated with foam. As purchased by the Leons, the back side of the chimney was flashed with metal to prevent water running down the roof from penetrating the brick. 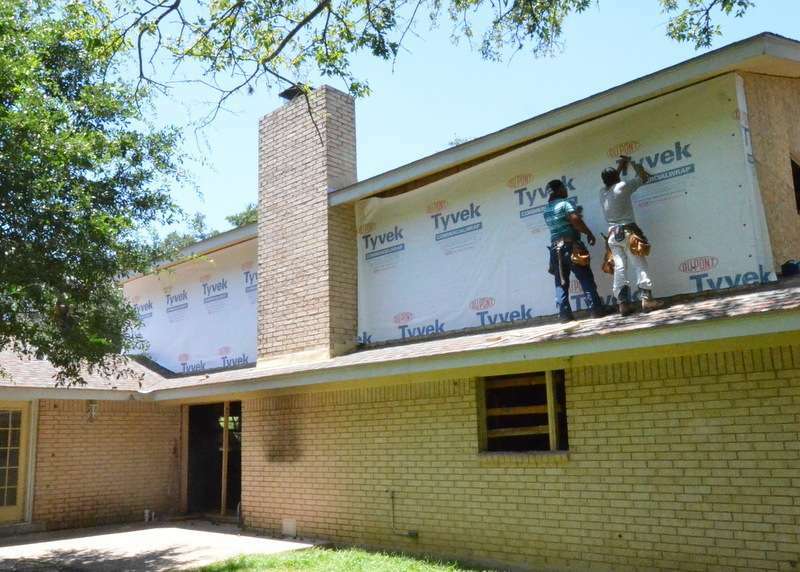 After 50 years, it’s time to approach this problem differently — because water got into the brick and ran down the brick and down the interior framing. 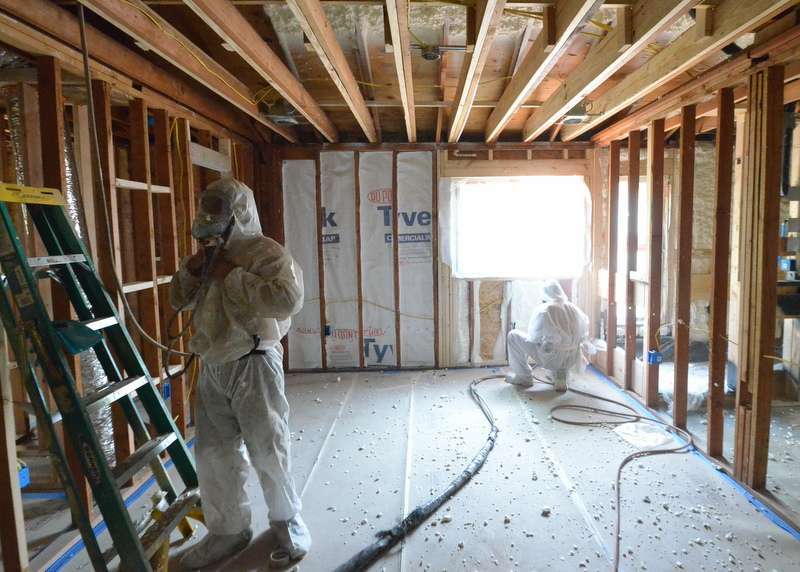 Mold grew against the tar paper sheathing inside the walls. As we discovered when Ranserve opened up the walls during demo. 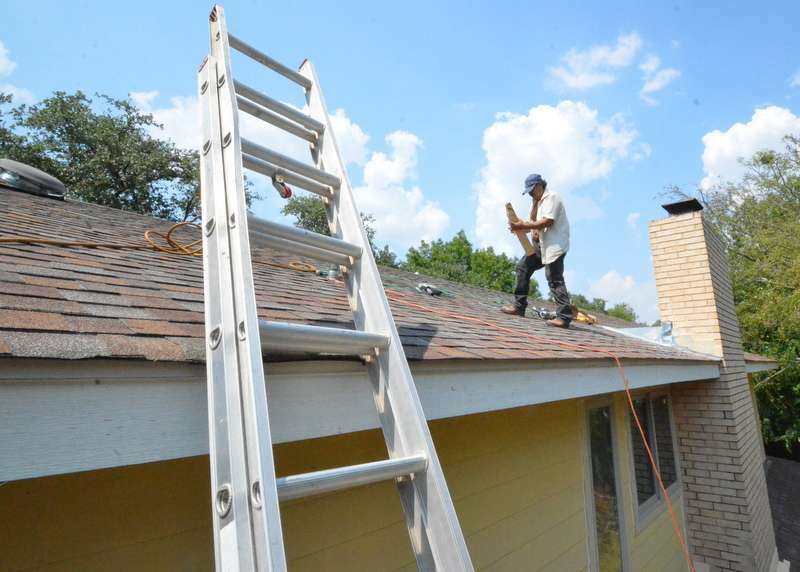 As a first line of attack, the roofer built and installed a metal “cricket” at the back of the chimney, inserting the metal under roof tiles. Instead of water cascading down the roof, slamming into and through the chimney brick, the V shape of the cricket diverts water away from the brick. 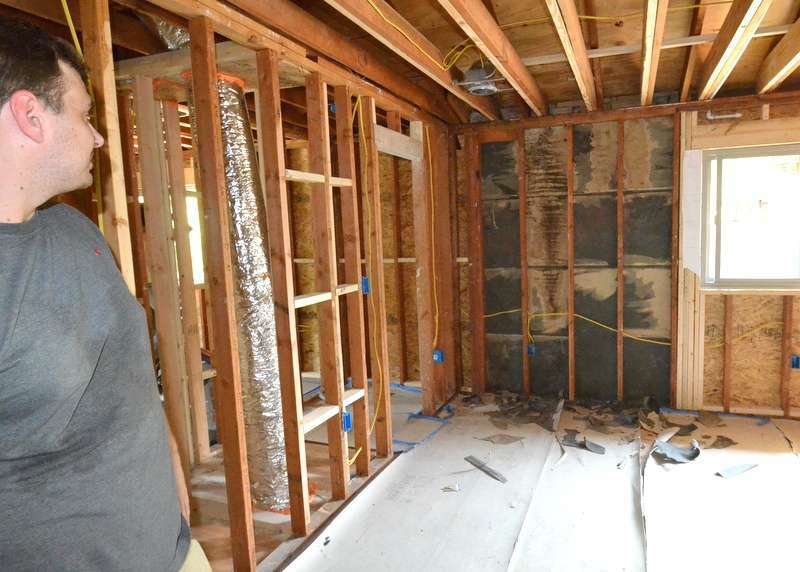 Inside bedroom 4 upstairs, Matt from Ranserve steps back to examine the tar paper sheathing he tore away from the backside of the brick. 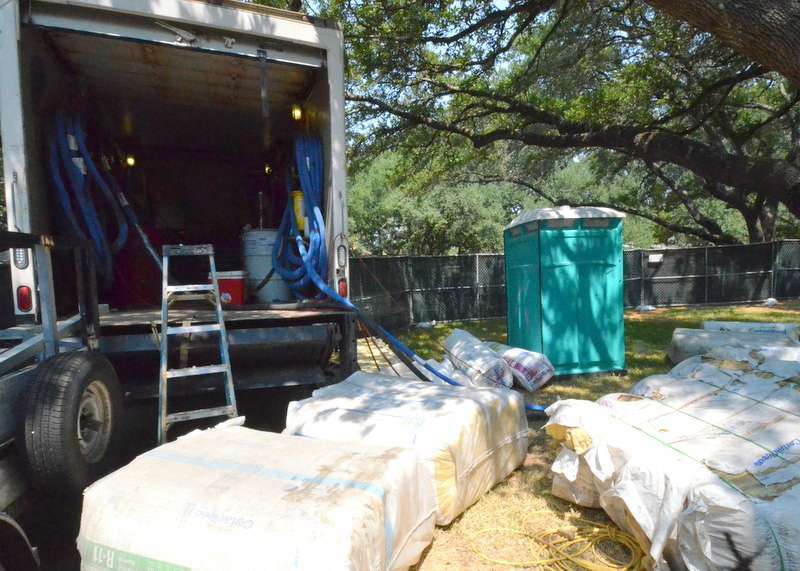 After 50 years, the tar paper rips easily and is dried out; it crumbles, actually. Water stains run down the brick and paper. Ron will spray the brick and lumber with bleach to kill any mold. After applying the bleach, and letting it evaporate, Ron and Matt stapled Tyvek sheathing to the studs and up against the chimney brick. 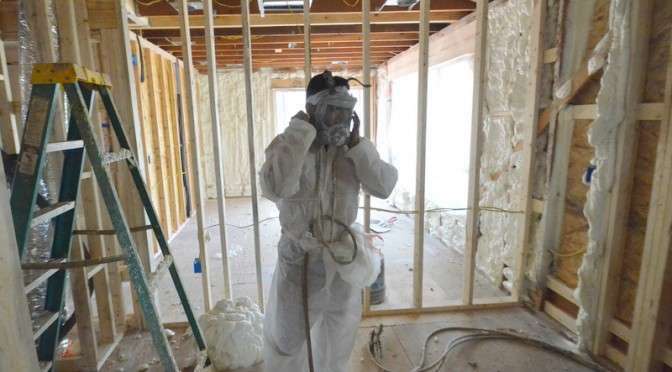 Two of the foam insulation installers suit up for the next step. 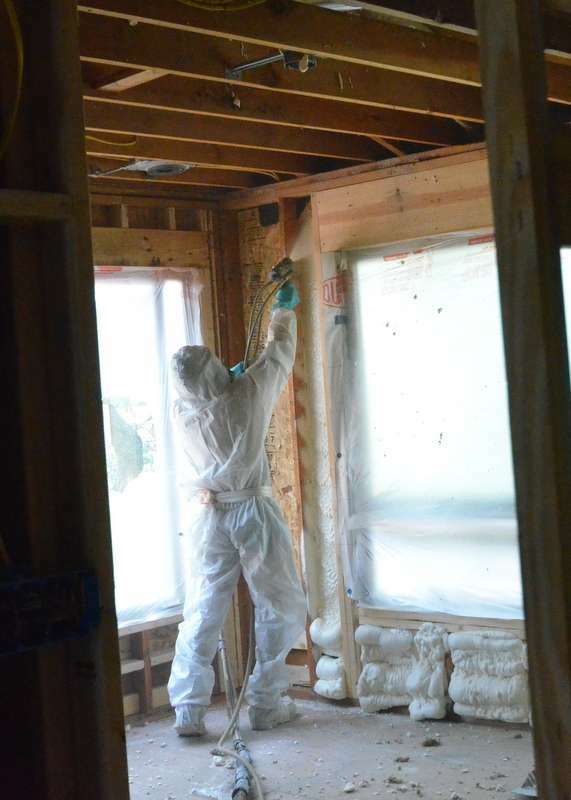 One of the installers sprays a light coat of foam against the corners of the Tyvek and studs. 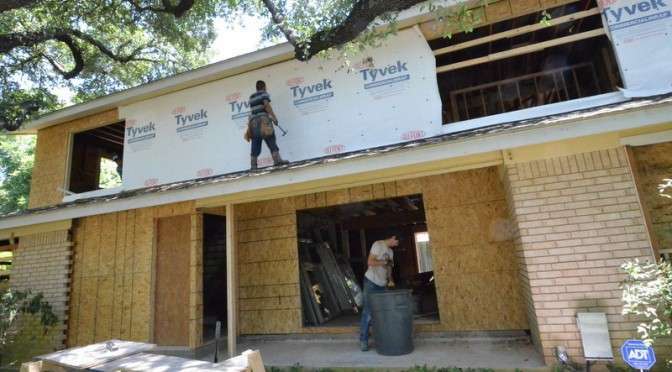 This pushes the Tyvek tightly into the corners and seals the joints. With the joints sealed, the installer begins spraying the entire stud bay. It’s a big day. Ranserve is insulating Emerald Hill. Framing is done. Plumbing rough-in is done. Drywall comes next. 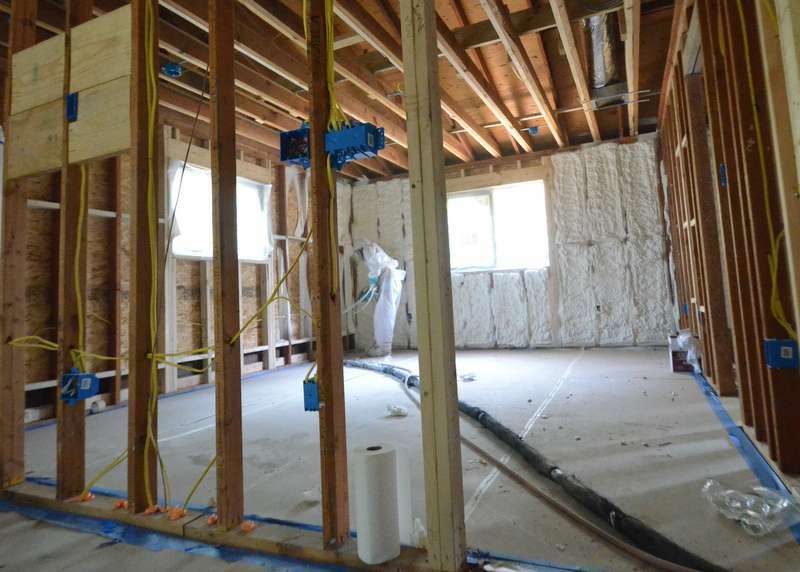 Eleven years ago, when we built Sea Eagle with Hagy Custom Homes, we were one of the first homes in Austin insulated with BioBased spray foam. 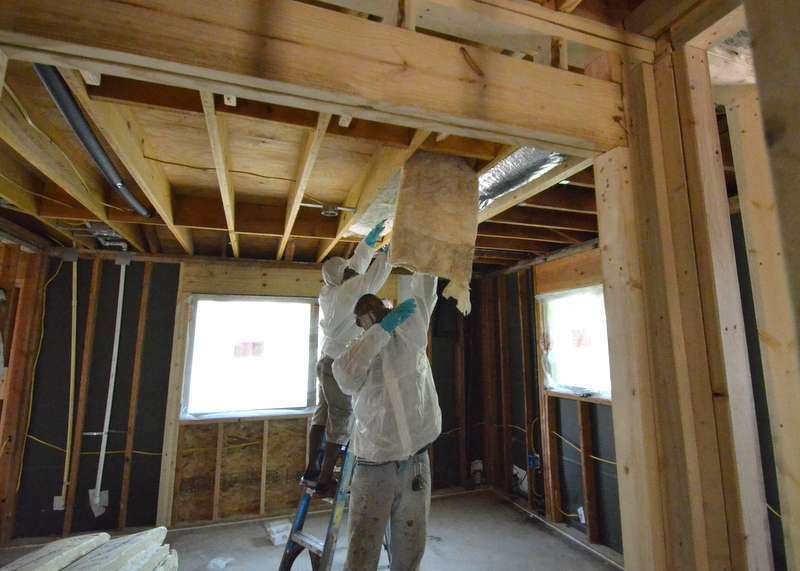 Spray polyurethane foam (SPF) is a spray-applied plastic that can form a continuous insulation and air sealing barrier on walls, roofs, around corners, and on all contoured surfaces. 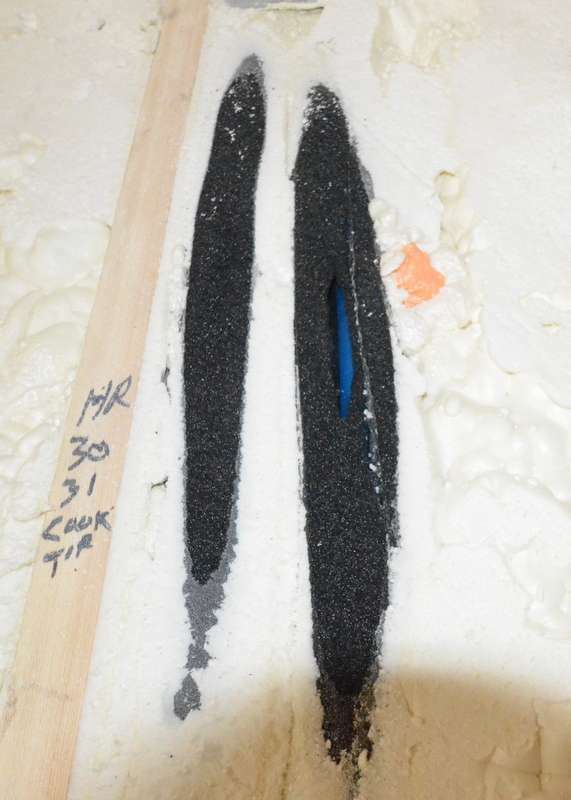 It is made by mixing and reacting unique liquid components at the job site to create foam. 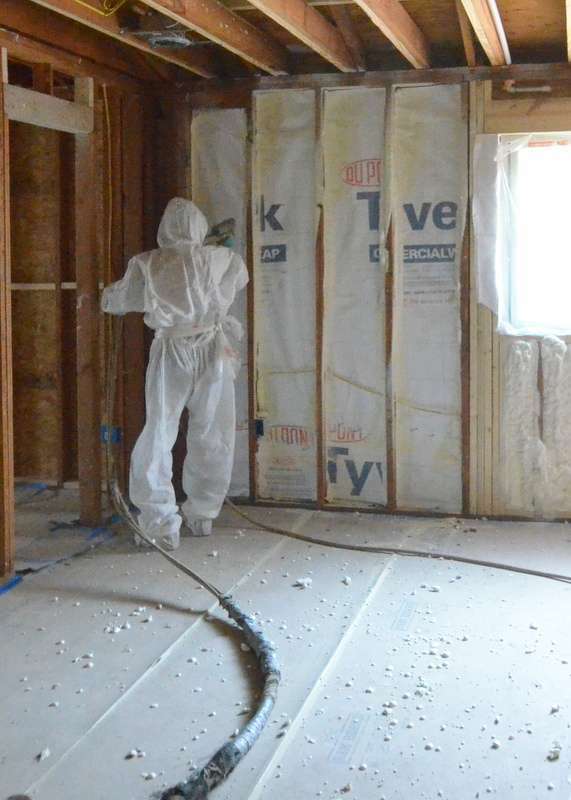 The liquids react very quickly when mixed, expanding on contact to create foam that insulates, seals gaps, and can form moisture and vapor barriers. 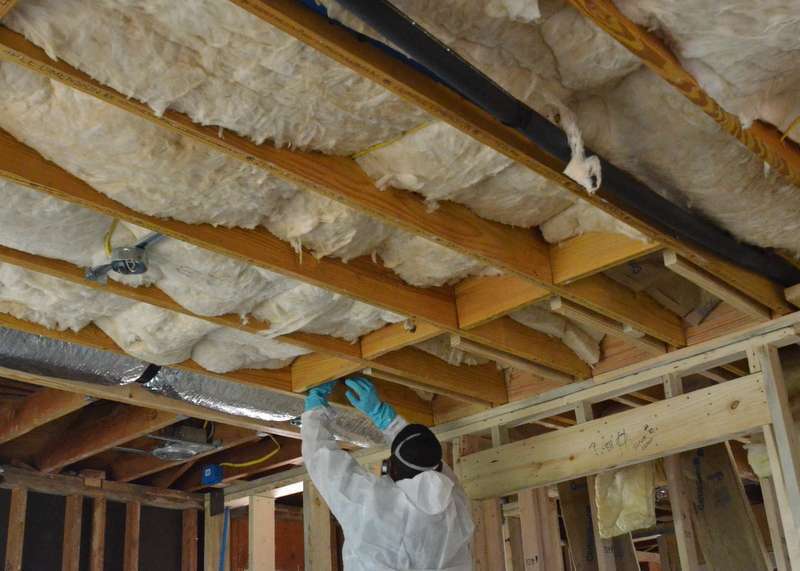 SPF insulation is known to resist heat transfer extremely well, and it offers a highly effective solution in reducing unwanted air infiltration through cracks, seams, and joints. 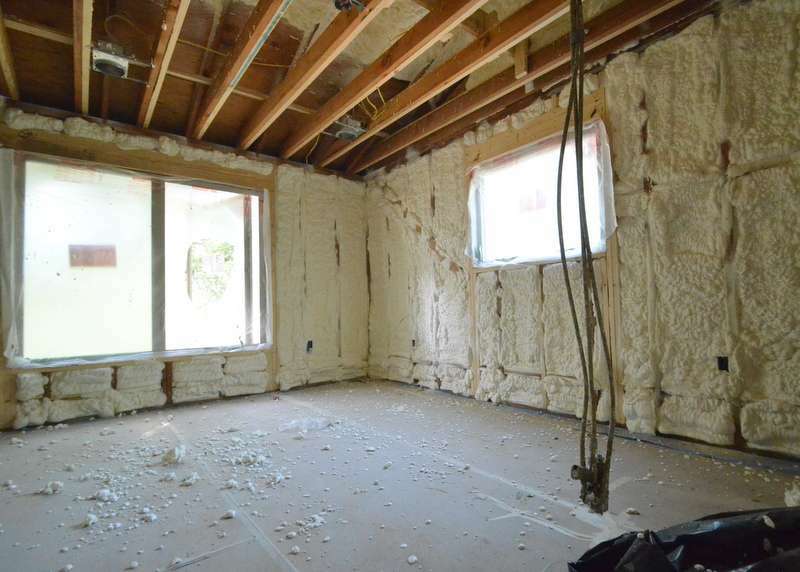 Spray foam makes sense. Sea Eagle is tight, comfortable, efficient. 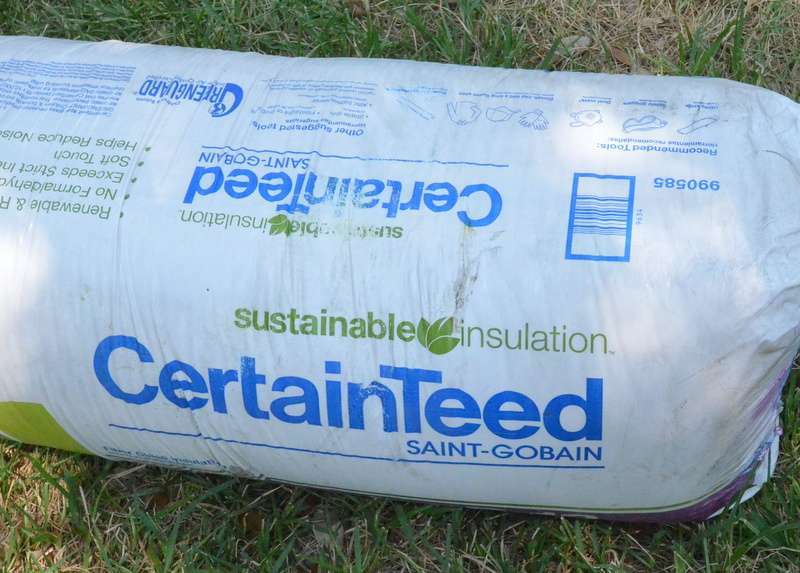 We believe our utility bills run about half that of nearby homes built about the same time that use conventional fiberglass batts. 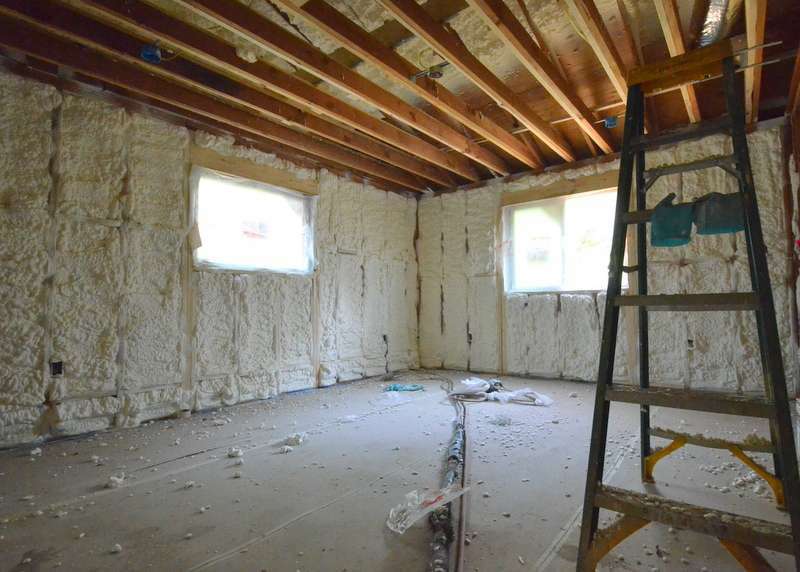 So we planned from Day 1 to insulate with foam. 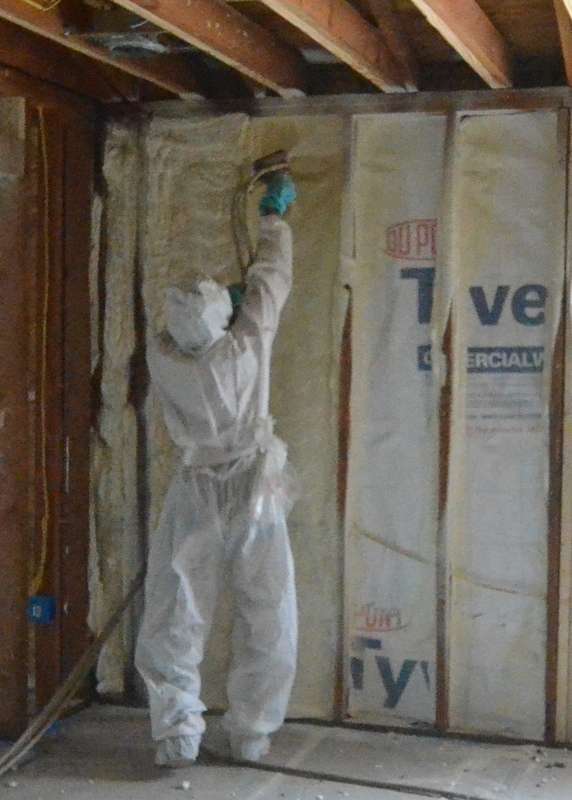 Before Energy Guard Foam Insulators pulled up to Emerald Hill this morning, Ron and Cris from Ranserve walked the house sealing up small penetrations with cans of spray foam. 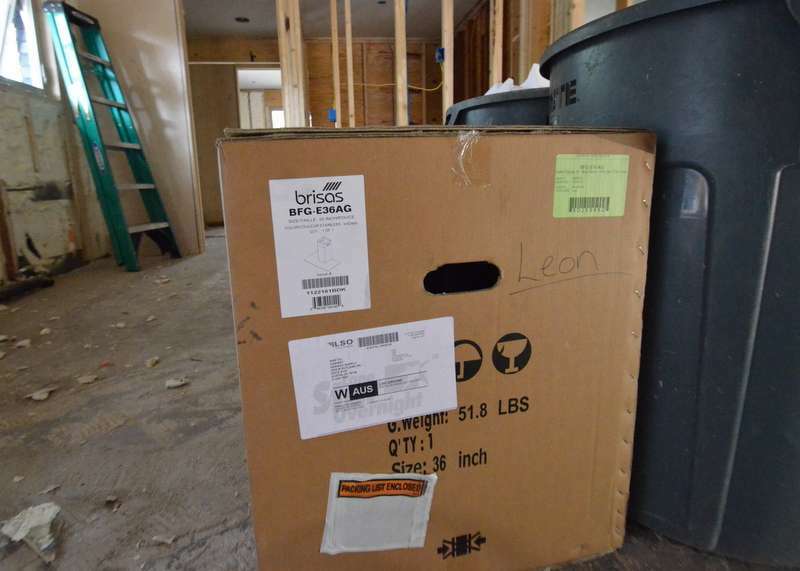 They also took the time to spray behind every electrical outlet in every exterior wall — “because the big guns the insulators use don’t always hit behind the electrical boxes,” said Ron. 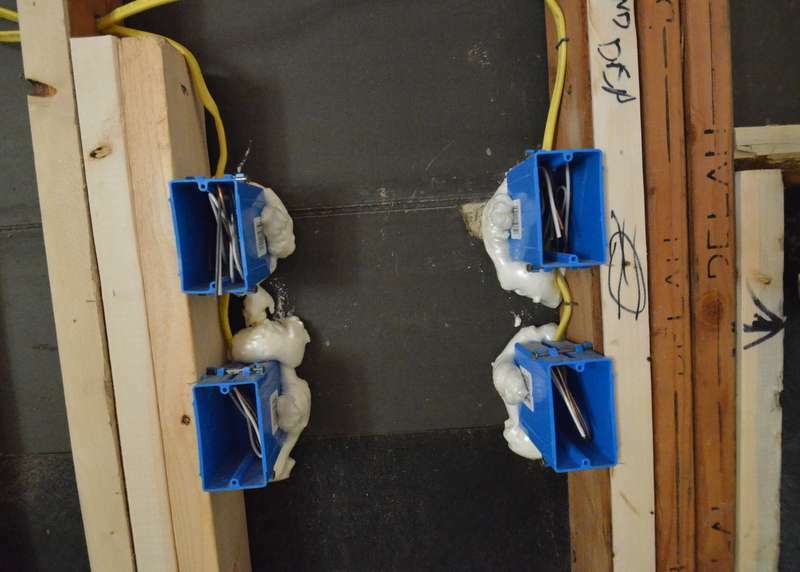 An example of the attention to detail from Ron and Cris as they prepared the house for insulation — spray foam applied behind every electrical box in every exterior wall, sealing any air gaps. 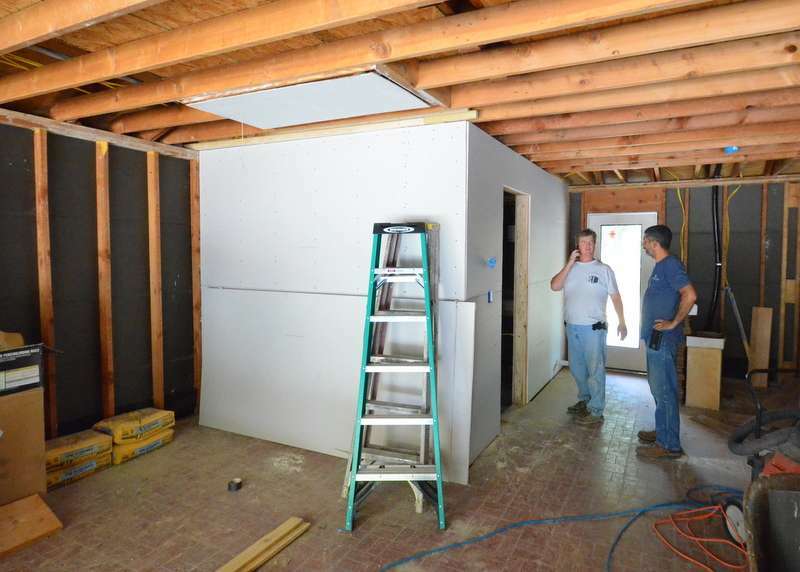 To spray two liquids that instantly react to create foam, you have to have a surface to spray — so Ron and Cris installed drywall on the shared walls between the mudroom and garage — the first drywall screwed into Emerald Hill! 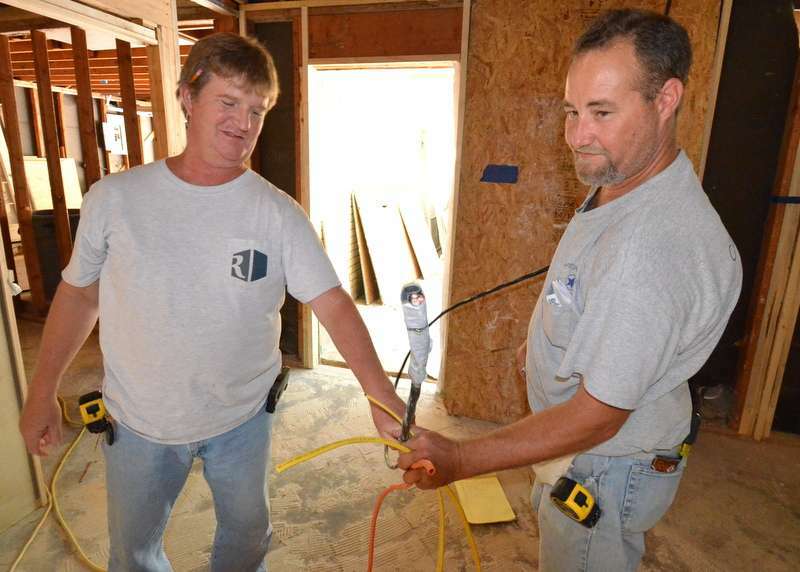 Ron, left, and Cris, right, in the garage, with drywall wrapping around the mudroom. 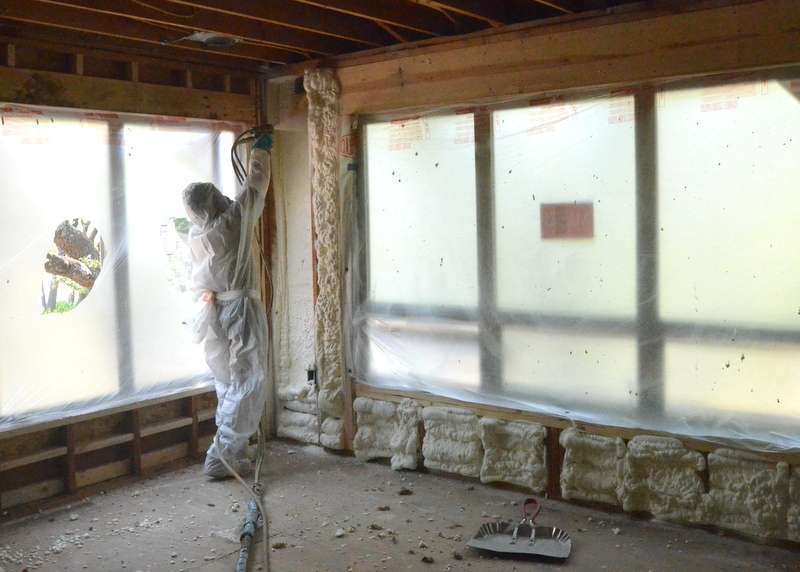 Downstairs, in bedroom 1, the insulation team begins installing sound insulation — fiberglass batts designed to attenuate the transfer of sound between rooms and floors. 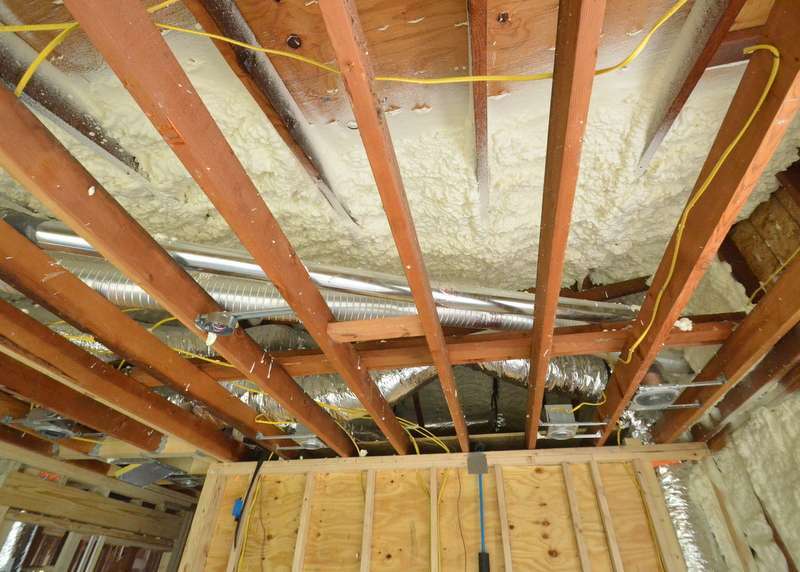 Expanding foam insulation is not as efficient at reducing noise as the loose batts, which trap sound in voids and fibers. The batts come squeezed into sausage-like bales. Here’s the back end of the pumper truck. Blue barrels of the liquid foam components on the right side of the truck. Batts waiting to be used on the ground, still in protective wrapping. About one hour later, most of the ceiling in bedroom 1 is insulated with sound-absorbing batts — and, already, noise reverberates significantly less. The East and South walls of the master bath, foamed. 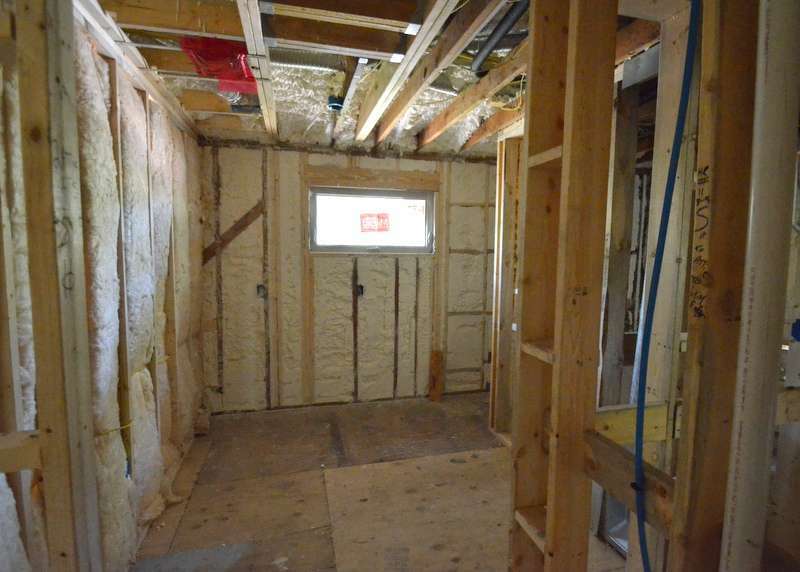 At right is the wall between the master bath and master closet, with plywood blocking installed to support the shelving and storage that Jacquela plans. Liquid parts A and B mix just ahead of the spray nozzle. As the mix hits the wall, it’s a liquid. 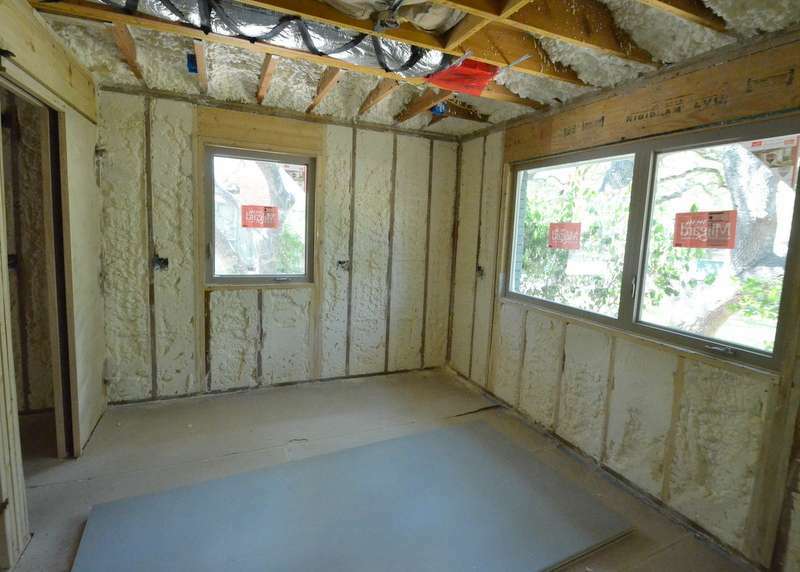 In seconds, it begins expanding into every corner that conventional insulation would never reach. The installer moves quickly from stud bay to stud bay in the master bedroom. Overhead, a second installer has begun spraying foam against the underside of the roof decking. 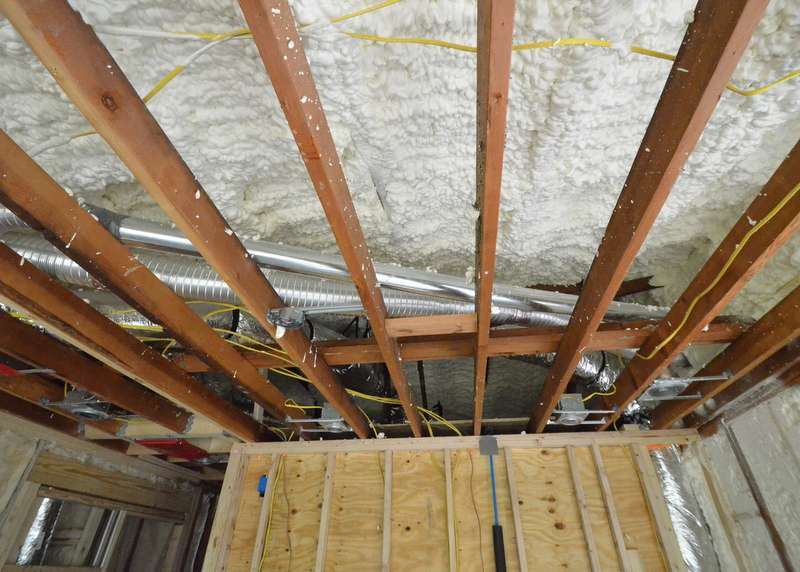 When this job is done, the attic and exterior walls will become one system, sealed and insulated with foam — a cooler turned upside down, pinned against the concrete slab, able to keep drinks and humans hot and cold for long periods of time with minimal use of energy. The model train room gets foamed. And here’s the train room after the installers shift to the next-door loft. The loft, foamed, with one of the spray guns hanging from the ceiling rafters. 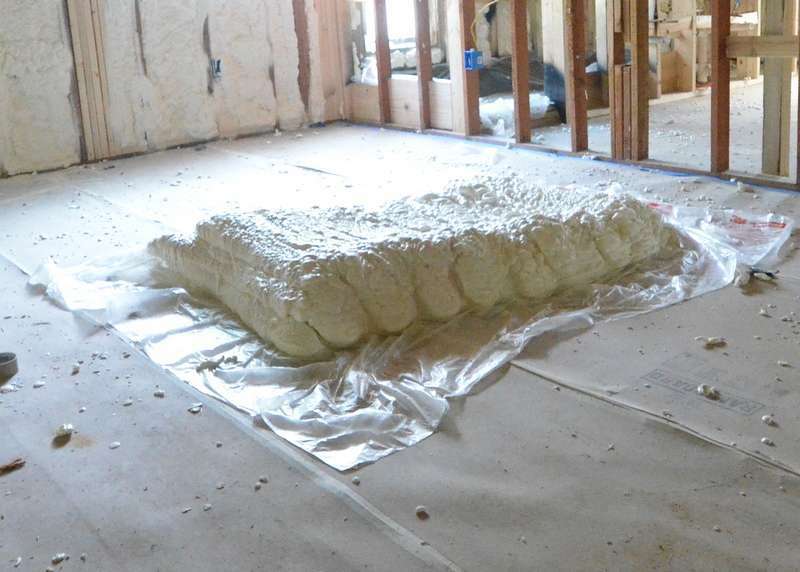 Ron asked the installers to spray a “loaf” of foam against a plastic sheet. Ron will use this to seal any holes he has to make in the house as construction continues after insulation is complete. He will slice out chunks as he needs them. The foam weighs almost nothing. This loaf is probably four feet by eight feet and you can pick it up with one hand. Electrical. The electrical walk continues, locating switches and outlets in the house. It’s day 3 of the electrical rough-in. Steve from Capstone Electric, Ron from Ranserve, and Steven focused today on the family room, kitchen, pantry, office, mudroom, garage, exterior lights. Almost two hours. With 10 minutes left over for Steven and Ron to talk about the flooring and building of stairs. Ron thinks he has it figured out. More detail to come. Plumbing. Albert and the team from Custom Plumbing continue to install red, white and blue PEX tubing for water lines, while also pressure testing the gas lines. Habitat donations. Steven contacted Habitat at Ron’s request to ask for a fourth pickup — we have more stuff pulled out of the house for Habitat to recycle. Draw 2. Larry at South Star reports the wire transfer payment by the Leons to Ranserve executed today. Kathleen at Ranserve is cheering. The Tyvek arrived. The framers are putting it up. Quickly. 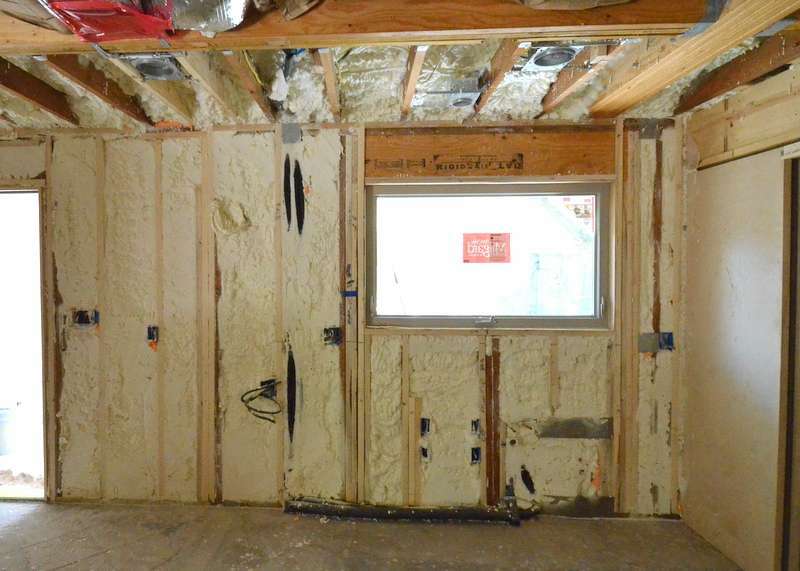 Another step toward better insulating the house.